Nokia's Comes With Music heading for the U.S.? After a successful trial in the U.K., Nokia is bringing its unique "Comes With Music" plan to the U.S. according to Ars Technica. The site is saying that they have been told by the Finnish manufacturer that sometime before this year is out, the plan that includes "millions of tracks for free" will be available in the States. However, no carriers or pricing was mentioned. 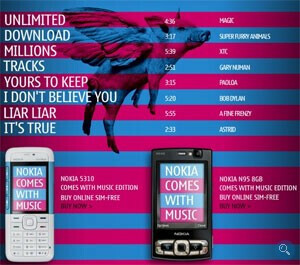 A Nokia handset that features "Comes With Music" allows the user to download as many songs as he wants for free over the course of a year. The selections come from a list of over 4 million songs that Nokia was able to procure by getting the four major labels and a number of indie artists to participate, and are downloaded in the DRM format which allows for the tunes to be transferred to a PC with software provided by Nokia. After the year expires, the user is allowed to keep and use the songs. The only way for someone to get another year of the service would be to purchase another handset that "Comes With Music". The service started with Nokia's XpressMusic 5310 released in the U.K. last October and that was followed by its inclusion in the release of a Special Edition of the 5MP cameraphone N95 and the 5800 XpressMusic. In January, the millionth "Comes With Music" equipped handset was sold and now the plan makes its way to Austraila in March with the release of the 5800 XpressMusic and should come Stateside sometime in 2009. While the service is free to the user, technically the cost is built into the retail price of the phone and adds about $30 to the price tag of a handset that features the plan.